Cochin, October 5, 2017:Kajaria Ceramics Ltd, the largest manufacturer of ceramic and vitrified tiles in India and 9th largest in the world on Thursday opened new exclusive showroom for its Sanitaryware and bath fittings “Kerovit”, added a new product range of Ultima series, and inaugurated their extended showroom of eternity and upgraded its Polished Vitrified Tiles display in the showroom. Kajaria has 4 verticals viz; Ceramic Wall & Floor, Polished Vitrified Tiles, Glazed Vitrified Tiles, and Sanitaryware and bathware. Southern India has always been a strong performing market for Kajaria, especially Kerala market. Kerala has been always a discipline, aggressive and cash flow market for us. With this magnificent gesture, the bond shared by Kajaria with dealers has strengthened even more. These new and expanded showrooms are to provide a delightful experience to walk-in customers. 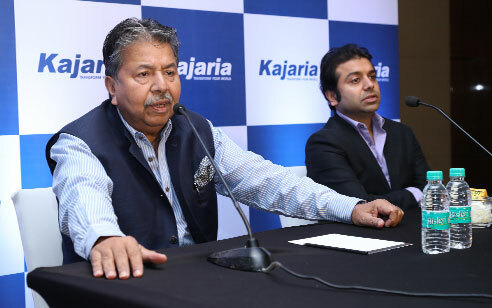 On this grand occasion Mr Ashok Kajaria, CMD, Kajaria Ceramics Ltd said, “We thank all our channel partners for their strenuous efforts and interest taken by them in promoting the brand-Kajaria. We value your association with us.Moreover, we are delighted to announce the start of new manufacturing plant in Andhra Pradesh expected to begin production by the end of year 2017-18”. Mr Rishi Kajaria – JMD, Kajaria Ceramics Ltd, also present at the launch further added, “We appreciate the modern thinking of people in Kerala. The market of Kerala is easy to work to work in as it adapts to new changes very quickly. This has always encouraged us to launch new products here as people are more exposed to international markets and have flexible thinking and value home aesthetics”. Kajaria in Kerala is growing at 15% which is higher than the total industry growth. Kerala contributes 15% to its total business approximately. In Kerala, Kajaria has more than 125 exclusive showrooms of different verticals like Prima, Studio, Galaxy and Star, catering to various needs of their customers.